Lately, I am very amused of my photos. I have two photos that showed off my unpleasant mood before the start of the New Year. 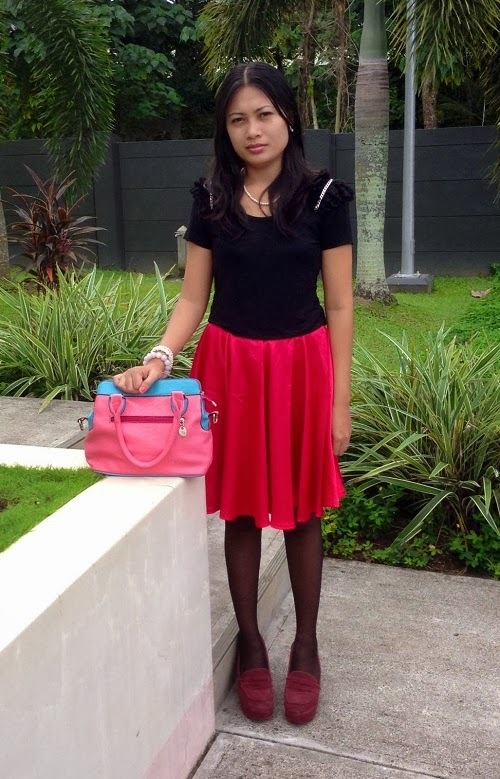 At that time, I want to have pictures of my pink and black outfit. My husband wouldn't listen to my suggestions. I became so anxious of the results that I want to postpone shooting. However, I managed to smile for my last two photographs. Are you irritable lately? Here are amazing ways to overcome anger. For me, overcoming anger is a skill. It is important to remain calm even in difficult circumstances. In my own way, I see to it that I and focused so that I won't be easily disturbed. I should keep my focus to finish tasks on time despite any hindrance along the way. Personally, I focus on looking at the beautiful side of life. The feeling of anger is normal. But we can divert our attention to the best things in life by overcoming it as quickly as possible. Since we know that it is not healthy to feel angry for a long period of time, let us tame our hearts to remain calm and loving. For me, fashion is a life-saver. It would be hard to go through difficult times without beauty all around us. It is very inspiring to use fashion as a tool to live a balanced life. After all, we dress up everyday. Hopefully, we can do it in a way to curb sadness and negative emotions. If we dress properly, we feel good about ourselves. We forget about nasty things in life and move on with a smile. What do you think? Have you smiled at your awkward photos? Let's talk about it in the comments section.